Total anomalous pulmonary venous return (TAPVR) is a congenital (present at birth) heart defect. Due to abnormal development of the fetal heart during the first eight weeks of pregnancy, the vessels that bring oxygen-rich (red) blood back to the heart from the lungs are improperly connected. Normally, oxygen-poor (blue) blood returns to the right atrium from the body, travels to the right ventricle, then is pumped through the pulmonary artery into the lungs where it receives oxygen. Oxygen-rich (red) blood returns to the left atrium from the lungs through four pulmonary veins. It then passes into the left ventricle, and is pumped through the aorta out to the body. In TAPVR, the four pulmonary veins are connected somewhere besides the left atrium. There are several possible places where the pulmonary veins can connect. The most common connection is to a blood vessel that brings oxygen-poor (blue) blood back to the right atrium, usually the superior vena cava. In TAPVR, oxygen-rich (red) blood that should return to the left atrium, the left ventricle, the aorta, and then the body, instead mixes with the oxygen-poor (blue) blood flowing into the right side of the heart. This situation by itself will not support life, because there is no way for oxygen-rich (red) blood to be delivered to the body. An opening in the atrial septum will allow blood from one side to mix with blood from another, creating "purple" blood with an oxygen level somewhere in-between that of the oxygen-poor (blue) and the oxygen-rich (red) blood. Patent ductus arteriosus will also allow mixing of oxygen-poor (blue) and oxygen-rich (red) blood through the connection between the aorta and pulmonary artery. The "purple" blood that results from this mixing is beneficial, providing at least a little oxygen to the body. Total anomalous pulmonary venous return occurs equally in boys and in girls. What causes total anomalous pulmonary venous return? The heart is forming during the first eight weeks of fetal development. The problem occurs during this time, allowing the pulmonary veins to be attached incorrectly. Why is TAPVR a concern? Two fetal "shunts," or connections present in the fetal circulation, remain open for a short while after birth. The foramen ovale, an opening between the right atrium and the left atrium, will allow some of the blood returning to the right atrium to flow into the left side of the heart, and on out to the body. The ductus arteriosus, connecting the aorta to the pulmonary artery, allows some blood to mix between the two vessels, allowing more partially oxygenated blood to go to the body. Another problem that occurs with TAPVR is that too much blood flows through the blood vessels in the lungs, since the pulmonary veins add extra blood back in to the circulation on the right side of the heart. The lungs become stressed by this extra blood flow, and can eventually become damaged from it. What are the symptoms of total anomalous pulmonary venous return? The obvious indication of TAPVR is a newborn who becomes cyanotic (blue coloring of the skin, lips, and nail beds) in the first days of life after the maternal source of oxygen (from the placenta) is removed. The degree of cyanosis is related to the degree of obstruction of the anomalous pulmonary veins, and the size of the foramen ovale that allows the red and blue blood to mix. Babies with large atrial or ventricular septal defects, allowing a mixture of oxygen-rich (red) and oxygen-poor (blue) blood to enter the left heart and go to the body, may have less cyanosis and fewer symptoms at birth. Babies who have a large foramen ovale or a ductus arteriosus that remains open for a while may also present with symptoms a few days or weeks after birth. The symptoms of total anomalous pulmonary venous may resemble other medical conditions or heart problems. Always consult your child's doctor for a diagnosis. How is transposition of the great arteries diagnosed? A pediatric cardiologist and/or a neonatologist may be involved in your child's care. 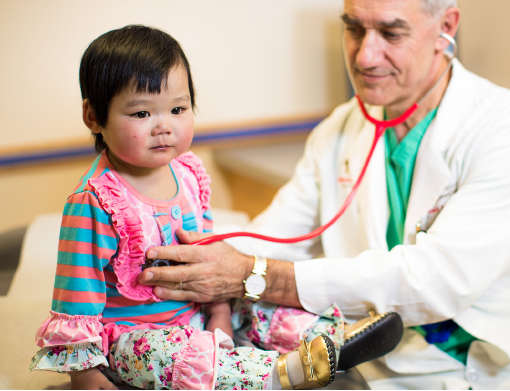 A pediatric cardiologist specializes in the diagnosis and medical management of congenital heart defects, as well as heart problems that may develop later in childhood. A neonatologist specializes in illnesses affecting newborns, both premature and full-term. Cyanosis is the major indication that there is a problem with your newborn. Your child's doctor may have also heard a heart murmur during a physical examination. In this case, a heart murmur is a noise caused by the turbulence of blood flowing through the openings that allow the blood to mix, such as the ventricular septal defect or patent ductus arteriosus. Chest X-ray. A diagnostic test that uses invisible X-ray beams to produce images of internal tissues, bones, and organs onto film. Electrocardiogram (ECG or EKG). A test that records the electrical activity of the heart, shows abnormal rhythms (arrhythmias), and detects heart muscle stress. Your child may be admitted to the intensive care unit (ICU) or special care nursery once symptoms are noted. Initially, your child may be placed on oxygen, and possibly even on a ventilator, to assist his or her breathing. IV medications may be given to help the heart and lungs function more efficiently. Medical management. Initial medical management may include oxygen, medications to increase blood pressure, and treatments with prostaglandins, a medication used to keep the ductus arteriosus open (although this medication may be contraindicated in certain forms of the disease). A special catheter with a balloon in the tip is used to create an opening in the atrial septum (wall between the left and right atria). The catheter is guided through the foramen ovale—a small opening present in the atrial septum that closes shortly after birth—and into the left atrium. The catheter is quickly pulled back through the hole, into the right atrium, enlarging the hole, allowing blood to mix between the atria. An IV medication called prostaglandin E1 may be given to keep the ductus arteriosus from closing. Surgical repair. The operation is performed under general anesthesia. The four pulmonary veins are reconnected to the left atrium, and any associated heart defects such as atrial septal defect, ventricular septal defect, patent foramen ovale, and/or patent ductus arteriosus are surgically closed. After surgery, infants will return to the intensive care unit (ICU) for a few days to be closely monitored during recovery. Ventilator. A machine that helps your child breathe while he or she is under anesthesia during the operation. A small, plastic tube is guided into the windpipe and attached to the ventilator, which breathes for your child while he or she is too sleepy to breathe effectively on his or her own. After a TAPVR repair, children will benefit from remaining on the ventilator overnight or even longer so they can rest. Arterial line. A specialized IV placed in the wrist or other area of the body where a pulse can be felt, that measures blood pressure continuously during surgery and while your child is in the ICU. Urinary catheter. A small, flexible tube that allows urine to drain out of the bladder and accurately measures how much urine the body makes, which helps determine how well the heart is functioning. After surgery, the heart will be a little weaker than it was before, and, therefore, the body may start to hold onto fluid, causing swelling and puffiness. Diuretics may be given to help the kidneys to remove excess fluid from the body. After discharged from the ICU, your child will recuperate on another hospital unit for a few days before going home. You will learn how to care for your child at home before your child is discharged. Your child may need to take medications for a while, and these will be explained to you. The staff will give you instructions regarding medications, activity limitations, and follow-up appointments before your child is discharged. High-calorie formula or breast milk. Special nutritional supplements may be added to formula or pumped breast milk that increase the number of calories in each ounce, thereby allowing your baby to drink less and still consume enough calories to grow. Supplemental tube feedings. Feedings given through a small, flexible tube that passes through the nose, down the esophagus, and into the stomach, that can either supplement or take the place of bottle-feedings. Infants who can drink part of their bottle, but not all, may be fed the remainder through the feeding tube. Infants who are too tired to bottle-feed at all may receive their formula or breast milk through the feeding tube alone. Pain medications, such as acetaminophen or ibuprofen, may be recommended to keep your child comfortable at home. Your child's doctor will discuss pain control before your child is discharged from the hospital. If any special treatments are to be given at home, the nursing staff will ensure that you are able to provide them, or a home health agency may assist you. You may receive additional instructions from your child's doctors and the hospital staff. Many infants who have had TAPVR surgical repair will grow and develop normally. However, after TAPVR repair, your infant will need to be followed periodically by a pediatric cardiologist who will make assessments to check for any heart-related problems. Regular follow-up care at a center offering pediatric or adult congenital cardiac care should continue throughout the individual’s lifespan. We have expertise in the full spectrum of cardiac imaging, including transesophageal, fetal, 3-D, intracardiac, and stress echocardiography and cardiac MRI. Our heart care begins before babies are even born, in our dedicated Fetal Heart Program, where we diagnose and even treat fetal heart conditions.